Can we all agree, Kim Jong Un, who says he will close his missile testing site and agree to sign a peace treaty with South Korea, isn’t leaving much for Donald Trump to demand, if the two men meet this summer? Can we all agree, it will be a while before anyone will eat romaine lettuce again? Can we all agree, James Comey’s notes after his meetings with Mr. Trump don’t reveal any new facts, but tell us volumes about The President‘s personality. 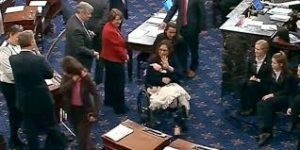 Senator Tammy Duckworth introduces her daughter to the Senate. Can we all agree, the demise of EPA Secretary Scott Pruitt has been predicted for a month, but it appears to be just wishful thinking, even though he seems to be losing support in the GOP? He is scheduled to testify before Congress this week. Can we all agree, everyone wishes the late Barbara Bush was still in the White House? Can we all agree, UN Ambassador Nikki Haley, may be the next top level administrator to leave the Trump administration? Can we all agree, Tammie Jo Shults is the kind of pilot we all want when disaster hits at 30,000 feet? Can we all agree, Senate Leader Mitch McConnell may not feel Special Counsel Robert Mueller needs protection, but Attorney General Jeff Sessions does? Can we all agree, the DNC will have to stand in line if they think their lawsuit against the Trump campaign will uncover any new information? Can we all agree, Senator Tammy Duckworth’s baby could easily replace a number of sitting senators, and the country would be better off? Can we all agree, Lance Armstrong’s $5million settlement ends a sad chapter in American sports, but it hasn’t done much to clean up competitive cycling? Can we all agree, Wells Fargo got off easy with a $1billion fine for defrauding millions of Americans and mistreating thousands of employees? Can we all agree, if Starbucks’ employees don’t know that arresting minority customers who ask to use the bathroom, is wrong, sensitivity training is not going to help? Can we all agree, adding Rudy Giuliana to his legal team will not save Mr. Trump? Can we all agree, naming a climate change denier with no science background to head NASA, just politicizes the agency? Can we all agree, humans have killed parts of the Great Barrier reef and even scientists don’t know the full implications? Can we all agree, passing another tax cut, when the first one you passed just a few months ago didn’t help the average American, defies logic? Can we all agree, it’s time for the Trump administration to find the money to fix the Puerto Rican power grid? Can we all agree, the end of the Castro era in Cuba may not change much on the island? Can we all agree, Sean Hannity needs to either give up his TV job, or his informal White House post, but he certainly needs a lawyer? Can we all agree, Kendrick LaMar’s Pulitzer Prize marks a turning point for that award? Can we all agree, no one knows what mission was accomplished in Syria? Can we all agree, Carl Kasell and Harry Anderson may have been off the air for a while, but they leave us with fond memories? Can we all agree, it was nice to have an extra day to file a tax return, but it doesn’t give Americans much confidence in the system, when computers crash on the day they are needed most? Even married couples are now threatened by deportation under the administration’s guidelines.